Comparison and economic evaluation of winter-active (phalaris and perennial ryegrass) and summer-active (chicory) pasture species for prime lamb enterprises. Site Location: Pastoria – 15 km north-east of Kyneton, Vic. Enterprises: Prime lambs and beef cattle. Farm area: 1829 ha (including 490ha leased). Livestock: 5600 cross-bred ewes (joined to terminal sires), 6800 lambs, 500 breeders and 200 heifers. Pastures, soils and landscapes on the farm: Sandy loams in granite hill country with a smaller area of farm with red volcanic soils. Around 60% of the farm has been sown to improved pastures consisting of sub clover and perennial ryegrass or phalaris, with some cocksfoot. Perennial weeds such as bent grass and sorrel are the dominant species in the unimproved areas. Michael O’Sullivan at the EverGraze Supporting Site assessing the Banquet II perennial ryegrass pasture. 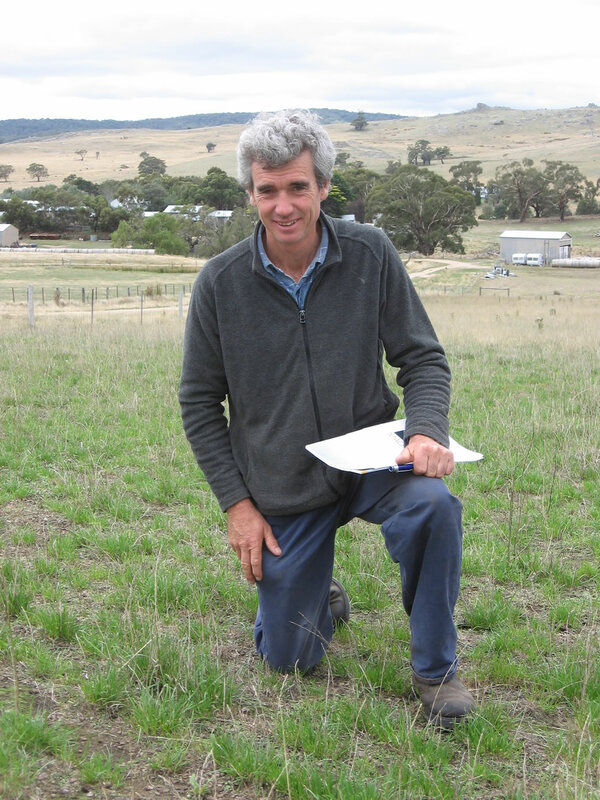 The site aimed to demonstrate how well managed perennial pastures could improve soil organic matter, ground over, root depth, reducing risk of erosion and nutrient loss while assessing the relative costs and benefits of different perennial pastures species and economics of pasture establishment. The site was located in granite hill country in central Victoria. The soils in this area are fragile sandy loams which are low in organic matter, prone to leaching of nutrients and prone to erosion. The topography presents grazing management challenges and it is difficult to maintain even and adequate ground cover across paddocks. In addition, this area had experienced three failed springs (2006, 2007, 2008) which put further pressure on producers, pastures and ground cover. Producers in the area were keen to establish more perennial pastures on their properties to improve carrying capacity and protect soils. Phalaris is highly valued as a productive and persistent perennial but as most of the producers in the group are producing prime lambs, they were interested in evaluating the cost/benefits of sowing a portion of their farm to the summer active perennial, chicory, and learning about its management requirements. While lucerne is also a highly valued species, most of the soils in the area are too acidic. Chicory is seen as a possible alternative to sowing brassicas which many producers have used to finish lambs but is not always successful due to unreliable summer moisture. The producers also wanted to compare the cost-benefits of early autumn (dry) sowing the highly productive but less drought tolerant perennial grass, Banquet ryegrass. 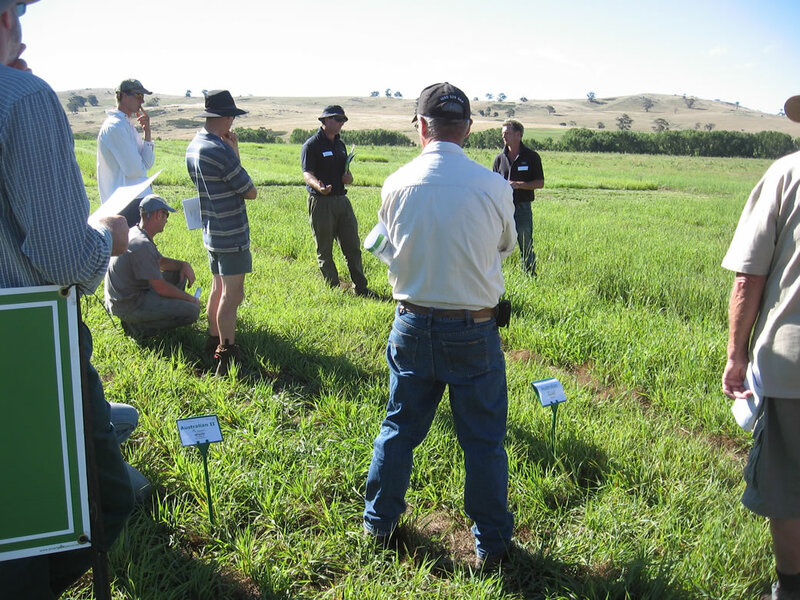 Local producers inspect the pasture variety experiment located adjacent to the phalaris paddock (January 2011). Paddock 1 (Control): Landmaster phalaris/sub clover pasture in half of the paddock. Advanced AT (aluminium tolerant) phalaris in the other half of the paddock. Sown at 4 kg/ha. Paddock 3: Chicory pasture. Sown at 5 kg/ha. Pastures were sown in mid November 2010. Sub clover was not included in the mixes due to the spring sowing. All paddocks received maintenance fertiliser and were rotationally grazed. The phalaris and perennial ryegrass established very well despite being sown late in 2010. Follow up rain through summer meant the pasture grew extremely well and were ready to graze by March 2011. Although sowing was delayed, sections of the chicory paddock were still quite wet at the time of sowing and this impacted on the chicory establishment which was patchy in these wet areas. The phalaris was very productive in its first year providing a large quantity of feed for ewes, lamb and steers. The ryegrass paddock provided less grazing, but it could be argued its feed quality in summer/early autumn 2011 would have been superior to the phalaris which was allowed to run to head to ensure good establishment. The chicory was grazed once in March, was totally dormant through winter and then was grazed again in October. Since the chicory was sown late, its peak growth period was not capitalised on in the first year. Establishment densities were excellent for the perennial grass pastures. For phalaris 62 and 69 plants/m2 established and for ryegrass 124 plants/m2. At the time the project ended, it was still too early to make conclusions about the persistence of the pasture species/varieties for this environment. There was some loss of plants by autumn 2011, but numbers were still high in both paddocks at 40-46 plants/m2 for the phalaris and 49 plants/m2 for the ryegrass. It is normal for plant populations to decline after sowing, as plants compete for light and nutrients, and then stabilise to a more sustainable density. A density of 20-30 plants/m2 would be satisfactory for an established pasture. The two phalaris varieties performed similarly with respect to persistence and composition. Advanced AT is more tolerant of aluminium than Landmaster, but in the first two years there was no obvious impact of the high subsoil aluminium on either variety. The two varieties were sown in different sections of the paddock and were not fenced off, hence separate grazing days for each variety could not be obtained. The chicory plant density was stable from the time of sowing. The chicory was allowed to flower and set seed in spring 2011 in an attempt to get recruitment of new plants. There was evidence of some new plants in autumn 2012, but this was matched by loss of some older plants. The perennial grass paddocks had minimal weed content in autumn 2012 and less than 3% bare ground. The chicory paddock had 7% bare ground and more weeds compared with the perennial grass paddocks. Sub clover was starting to fill the bare spaces in the chicory paddock, but if the ground cover and growth in this paddock didn’t improve by the following spring, it would be over-sown with perennial ryegrass. Preliminary economic analysis showed that the cumulative cash flows for the phalaris investment option would break-even with the “do nothing” (unimproved pasture) option in 5-6 years, while the perennial ryegrass option would take 7-8 years. The phalaris pasture option had the highest Net Present Value and best return on additional capital. The Supporting Site was an excellent demonstration of performance of different species under grazing and had the added dimension of a replicated species experiment to compare dry matter yields. Seedmark are continuing to monitor/harvest the experiment which includes cultivars of phalaris, perennial ryegrass, cocksfoot and tall fescue. 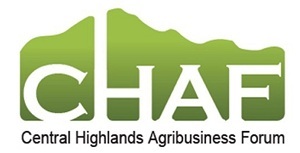 This site was supported by Caring for Our Country, Central Highlands Agribusiness Forum, the University of Melbourne and Future Farm Industries CRC through the National EverGraze Project.